The new law prohibits recording an interaction without the consent of all parties under two conditions: surreptitiously and when the recorded party has a reasonable expectation of privacy. Both of these exceptions will be difficult to prove either way in court. Since most people now carry a device capable of capturing video, it would be challenging to show that any recording was planned in advance – a key component of secret eavesdropping. The “surreptitious exception” invokes a moral complication. 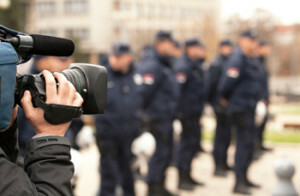 If you are hoping to document police crimes by video-taping an arrest, a beating or what you think is verbal harassment, the act of recording itself is likely to change the behavior of law enforcement. An officer of the law who knows they are being recorded is less likely to commit a crime. In that sense it is possible to regard the new law as a deterrent, which is good as far as it goes. However, the chances of catching serially bad behavior on the part of someone who is supposed to be a good guy are actually reduced by this component of the statute. Somewhat less fungible is the “reasonable expectation of privacy.” It is hard to imagine a scenario in which a public official believes they are entitled to privacy while doing their job. Unfortunately, one never knows what creative interpretations might arise in the actual prosecution of a case. A subset of the good news/bad news aspect of this bill is that it reduces the penalties for citizens who violate the statute. Previously, violations were a Class 1 felony with potential sentences from 4 to 10 years; now illegal recording is a Class 2 felony for which you might expect to spend 3 to 7 years in prison if convicted. But the amended law also reduces the penalty for illegal law enforcement eavesdropping from a Class 2 to a Class 3 felony. Both the new law and the old are comfortable with a punishment gap between law enforcement officials and citizens who commit the same “crime”. An additional stealth provision of the new law is that it expands the circumstances under which officials can eavesdrop on private conversations without a warrant. So along with a small step forward for official accountability comes corresponding step backward. This portion of the law will also end up in the higher courts. The odds are high that most people will make a decision to videotape police behavior on the spur of the moment or under some sort of time pressure are. Whether you are personally involved or documenting police interaction with a third-party, you are probably not going to have time to analyze the legal implications of your actions. That’s why it’s important to be aware upfront that you are engaging in an activity that could be legally uncertain. From a private citizen’s perspective, it is too early to say whether the ambiguity of the law will ultimately work to the benefit of citizens. Until it is tested in the real world but before you press record, ask yourself if you are willing be a poster child for official accountability under a slightly improved Illinois Eavesdropping Law.